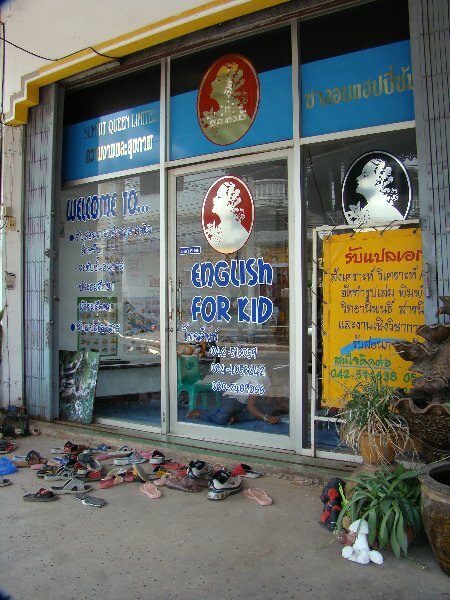 I had totally forgotten about this little English school in Nakhon Phanom until I ran across some pictures while I was editing. The day I took this picture I was just wandering through town enjoying it’s beauty, and if nothing else Nakhon Phanom is very beautiful. When I saw this school I thought about opening the door as I passed and saying hello which is something I would have never done back home or even thought about doing. So, I did it. The funny thing is that I didn’t get a chance to say hello before the children all screamed hello at me. I think they spotted me earlier and were planning a hello attack of their own. Everyone laughed and it really made my day. I think it made their day as well. seeing all their excited faces as they explore a new language made me think about myself as I explore a new language and a new land. It’s easy to get lost in our day to day lives and reminders like this bring me back to the realization that there is much more to life than the hustle and bustle of our daily lives. I hope those kids keep that sense of excitement about their learning as much as I hope I never lose my sense of excitement about exploring the world around me. Ditto. Although, I have noticed a difference in how I respond now, compared to how I responded just several years back. lol ..I can imagine the merchants loved you a few years ago. Talen can’t fault you on that one, life is to short to not open the door of opportunity when you pass by. Mike´s last blog ..Life in Thailand: A Wing and a Prayer. You get your fill to eat ,but always keep that hunger. Whenever one door closes ,I hope one more opens. And when you get the choice to sit it out or dance . Some very good lyrics there Malcolm…Something to live by. I tried counting the shoes outside the door but gave up, there’s too many. That must have been one big loud hello followed by many a flashing smile and giggle.The simple, free things in life are often the best. It was a very loud hello. Here I thought I was going to surprise them and they ambush me. But it was a pleasant ambush that still brings a smile to my face. My “several years” back go to the pre-Thailand era, when I would never think of opening that door here in the west. There’s a travel agent on soi 19 Sukhumvit that I used to use for two or three years. The two girls working there were very generous with their help about flights, visas and Bangkok features. All done without earning any fees. Now, every time I walk by I stop, open the door and say hello. The returned smiles are worth it and they do remember me. It’s nice to be remembered, but I had to travel halfway around the world to experience and appreciate it. And I’m happy to reply in kind.